The following information is kind contribution by our forum members Lydux, BlueBMW and RobIvy64. Thank you guys for another GameSX exclusive article ! 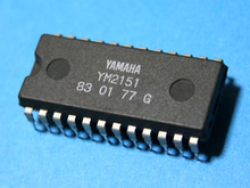 You can use this information to troubleshoot audio problems on other X68000 models, just be warned that part descriptions which are printed on PCB will differ. Both of these items are cheap and can be easily found on eBay. If the sound is coming out distorted or at a very low volume, the first thing you can try is replacing all capacitors. If that does not help, you could have a bad amplifier on Op-Amps (MC3403) or the dual channel DAC (YM3012). It could also be a power regulation problem on amplifier part. You can check this with a voltmeter on op-amp (pin 4 and 11). They should be +12v and -12v. If there is a PSU failure on -12v rail, it will cause distortions. 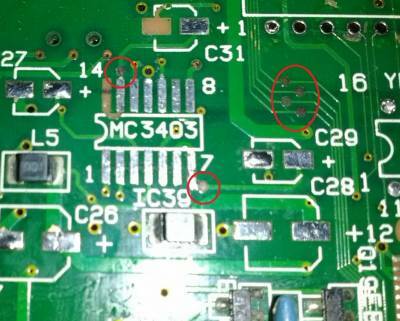 Please note that acid from leaked capacitors can eat up traces above and below the solder mask and traces which look fine can be corroded and broken below it. Please test all suspected traces for continuity. 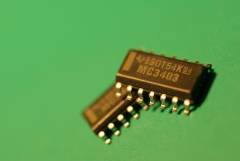 It is a regular quad op-amp in SMD SO14 package. 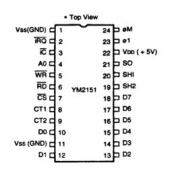 Compatible devices are TL074ACD which is preferred over LM324. IC106 - NJM2073. 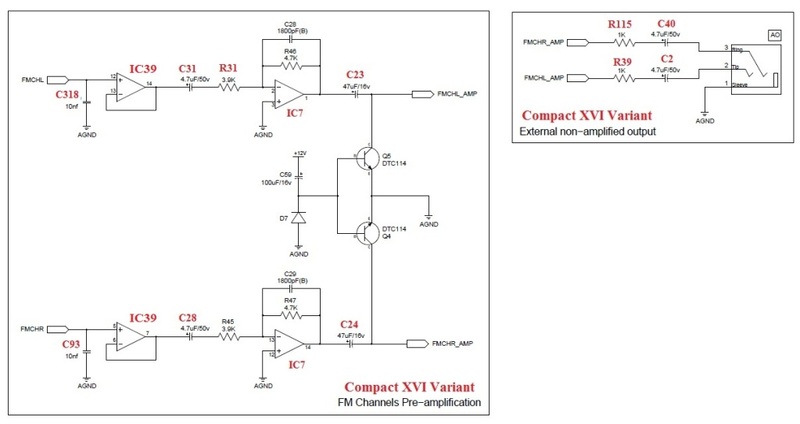 It's a dual opamp, used for headphone amplification and in most cases can be safely ignored. 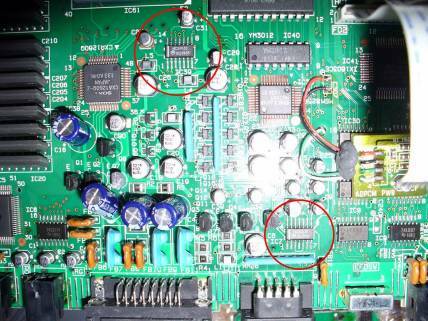 The circled test points in the right picture can become corroded and broken. Please test them for continuity. 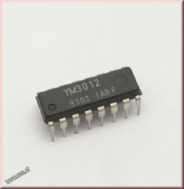 There is a RESET pin on YM3012 (pin 7 = ICL#) which should stay to a 1 logic (High) on normal operation. 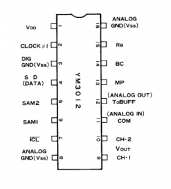 If stuck to a logic 0, it will keep initializing both channels, so no analog output. You can also check DAC amplification (the part at the right of YM3012), and channels preamplifications. Relevant components are all ceramic precision capacitors (C91, C28 and C29). These are rated at the lowest possible tolerance (B = ± 0.1 pF), this is very important. 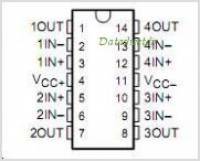 Also, transistors Q4 an Q5 may be faulty, or the diode D7 could be shorted. For further troubleshooting please use the following schematics which have been kindly contributed by Lydux and updated by BlueBMW. Please note that component names which are not in red could have different part numbers.